SW end of house looking north. A small but keen group of volunteers turned up to continue working on the foundations of the south-west end of the Cottage. Last week’s sondage through the chalk rubble fill of the interior of the extension on the south end of the house was widened. 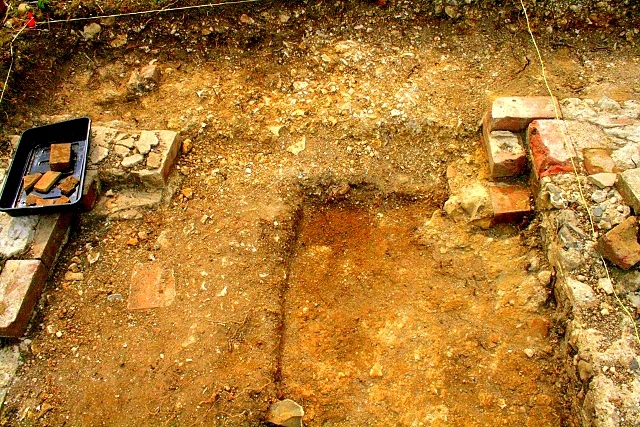 Colour-enhanced photo of excavated extension. It was found that the mortar foundation found underneath it (lower right quarter of above photo) extended right across the floor of the room. The original floor was lost to WW2 artillery and the 1950 bulldozer which cleared up afterwards. 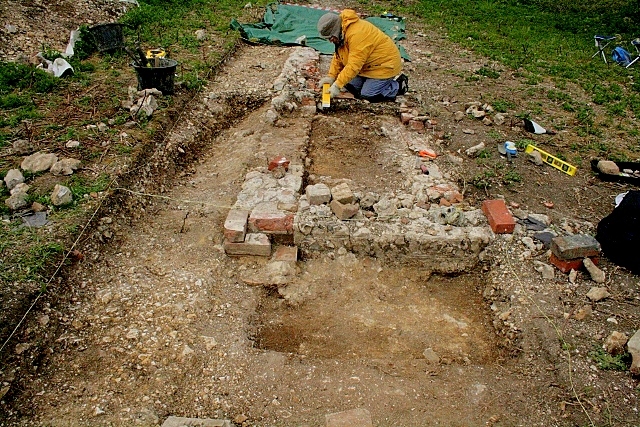 This chalk rubble was therefore most likely redeposited material which had been dug from the foundation trench. A single floor tile found on top of this rubble fill may be all that is left of this room’s original floor. Elsewhere, from the bulldozed mound of demolition rubble a further reminder of its WW2 history was found in the form of half a hand-grenade casing.